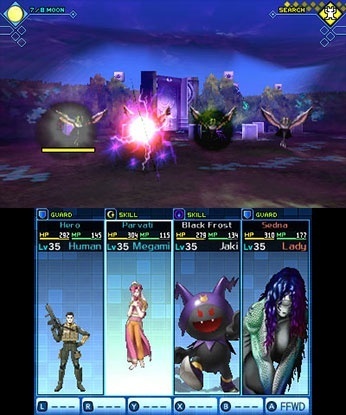 In the twilight years of the Nintendo DS, Atlus published Shin Megami Tensei: Strange Journey. Sadly, it was an easy game to miss, what with several blockbusters sandwiching both its North American and Japanese release dates. Now in the twilight years of the 3DS, Atlus is busting out an enhanced version of that game and giving it a new lease on life. Whether or not you gave it a chance before, it deserves another one. Strange Journey’s story seems deceptively straightforward. The player controls an unnamed soldier (or rather, player-named) sent by the United Nations to save the world from a mysterious calamity known as the Schwarzwelt. Said calamity is slowly expanding outward from the South Pole, so you’ll have to pay a visit to an alternate, warped Antarctica to investigate. Did I mention there are demons? The game’s opening does a good job of depicting the kind of chaos that is unfolding in the world as a result. Through bickering world powers and representatives, we learn very specific details about the events on, say, the economy of South America and the fish population in Central Asia. The media is even pushing fake news to prevent mass hysteria. Though the adventure players are in for is a bizarre one indeed, these details serve as a bridge to another world, presenting scenarios that feel a little too real. The news briefs come built-in with scathing jabs and commentary on humanity’s leadership systems, especially concerning resources, the environment, and internal competition. Subtle it is not, but it sets the stage for these perceived failures to be better explored through sharp dialogue, cryptic symbolism, and dreary allegories. After a few hours, the breadth of the topics at hand will start to make your head spin. Again, because the specificity of the intro is so potent and grounded in reality, it means everything when players actually land in the Antarctic region of the Schwarzwelt. The story is framed well enough that you already know this is so much more than an archetypal “save the world” JRPG mission. What even is the world? Is this a quest for salvation or just prolonging the inevitable? How does our reality stack up against the unknown? Insert yourself into the role of the main character, though, and you’ll probably ponder “what fresh hell awaits me?”. Strange Journey may be heavy-handed in articulating its points in the early going, but it remains purposeful and evocative throughout. The sci-fi elements such as the Demonica (a high-tech suit built to survive the conditions of the Schwarzwelt) give the game a very different vibe despite the fact you’re constantly employing demons to do your bidding. Megami Tensei outings are often grounded in settings familiar to the target audience such as high schools and Japanese cities (with some demonic juxtaposition thrown in for good measure), so there’s something to be said for this uniquely frosty and inexplicable land. Certain vehicles, plot points, and designs here instead reek of influence from western cinema, so that aesthetic might well magnetize those who have previously looked past the series. When the structure that Shin Megami Tensei is known for finally rears its head, it all kind of becomes a train wreck you can't look away from. As demons are introduced and your crewmates experience all manners of horrors, you'll spend the rest of the game's running length examining humanity's absolute worst aspects. Perhaps even some of its strengths and coping mechanisms too, but not with the same delightfully devilish tone. You first tip-off comes when it's mentioned that some say the Schwarzwelt is the earth’s self-defense mechanism against the havoc that humanity has wrought upon it. 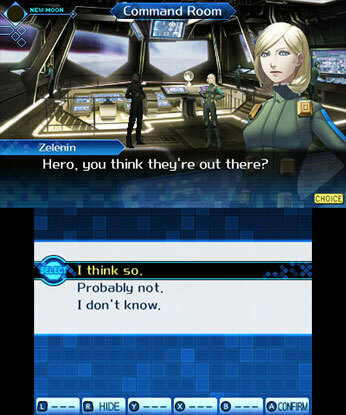 Getting overly specific about the voyage would threaten the mystique the game so expertly builds up, but rest assured that Strange Journey lives up to its subtitle while tackling heavy themes. There's even a teensy bit of commentary on pedophilia, proving that no subject is too daunting or beyond Strange Journey’s scope. Because the game addresses viewpoints of the world, missing out on religion would be a gaping hole even if that opens it up to some controversy. Demons are often modeled on The Bible and Hinduism, but Egyptian and Norse mythology are not out of the question, nor is Japanese folklore and or any form of the occult. To series newcomers, the knee jerk response might be to get offended. On the other hand, the fact that creatures and plotlines that people have believed in for thousands of years appear means they’re providing a more complete philosophical discussion. Besides, few abominations created solely for a game could carry the kind of existential dread or scholarly intrigue as ones that have existed in text for great swaths of human history. It’s not unprecedented for monster-collecting games to take inspiration from religion and folklore, but few have that same thematic consistency or lore as the Shin Megami Tensei games. You won’t see sentient ice cream cones, but that’s not to say the game can’t be goofy or darkly humorous when it sees fit. As the player navigates the Schwarzwelt, they’ll be faced with numerous dialogue choices. Rather than be fluff, these fundamentally shape which of several endings you’ll get, each representing some extreme view of the world. The fact that you’re a fairly nondescript protagonist with less “character” and personality than the showier ones throughout the series’ history helps facilitate this well. 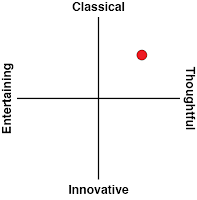 As a result of the system, you’ll also have access to more varied and nuanced viewpoints of human society than the game’s stern introduction implied. These endings are far more morally complex than you’d expect. It’s a matter of perspective rather than “here’s the happy end” or “here’s the tragic one’. Yes, these alternatives are natural extensions of the game’s philosophical musings that make it so poignant in the first place. It’s one of very few games I’ve played where having a single, definitive ending would actively make it a lesser experience. 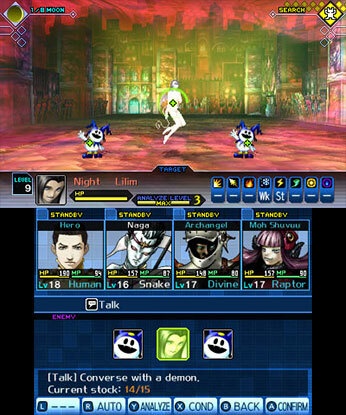 Though it is absolutely a Shin Megami Tensei game, Strange Journey bears more than a little resemblance to Etrian Odyssey; first-person dungeon crawling is the name of the game here. There’s no big traversable overworld and precious few distractions. Thanks to the brilliance of the game’s setup and its philosophical underbelly, though, you’ll rapidly learn to love this. Dungeons are quite vast, making the mere act of exploring feel unsettling regardless of the difficulty setting you pick. The traps and pits certainly don’t make things any more welcoming. 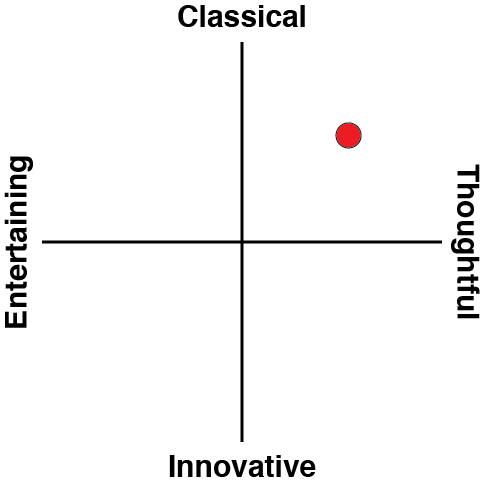 This in turn helps underscore that "fear of the unknown" vibe the game excels at emanating. Dungeons are constantly introducing new ideas such as teleportation and one-way doors to keep the formula fresh and all manners of hidden passages and shortcuts just beg to be unearthed. Locations can thematically represent certain flaws in humanity, making them mentally stimulating no matter how many hordes of demons you encounter in your path. Speaking of demons, the combat system makes confronting them an engaging ordeal. 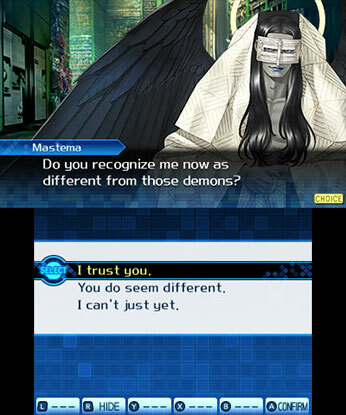 As in many Megami Tensei games, recruiting demons is essential to survival. Answering questions, trying to bargain with them, and figuring out what they're thinking is as simultaneously fascinating and aggravating as ever due to the finicky nature. If you can soldier on, though, you’ll find hundreds of demons to tinker with (which are, as mentioned earlier, heavily influenced by religions and mythologies from around the globe). Some demons are blatantly more practical than others, but all contribute something to the experience. The familiar demon fusion function plays a key role, particularly as you get deep into the game and have to square off against vexing bosses. The demon co-op system makes battles speedier and encourages players to deeply consider their party structure by rewarding players with extra consecutive hits depending on elemental advantages. Power for the power’s sake isn't necessarily the wisest choice since you can miss out on damage opportunities if your team is overly homogeneous. The first time you meet any demon, though, it will be an indecipherable blob. I have no doubt this will irritate some players as it’s much harder to predict or react to an enemy you can’t speculate about or get any kind of read on until you throw caution to the wind. Conversely, I found this sucked me into the strange, oppressive world even more. Wins and losses can seem like the luck of the draw at the absolute worst of times, but perhaps I’m more tolerant given the game’s theme and exposure to roguelikes. As far as new additions go, Strange Journey does offer up some solid additions to the DS original. Voice acting adds quite a bit of life to the characters, even if some will lament the lack of an English option. Then you’ve got quality of life improvements such as making backtracking far faster. The game is touched up in spots but the nature of dungeon crawling means it's not a game that really needed much visual polish anyway. You won’t find a 3D effect that might’ve uniquely livened up the first-person dungeon crawling, but it seems most developers have abandoned that at this point. There’s the Womb of Grief, a massive new dungeon with plenty of storytelling and lore to sink your teeth into. By far the most crucial are the extra endings and an additional character, which will probably convince those on the fence. 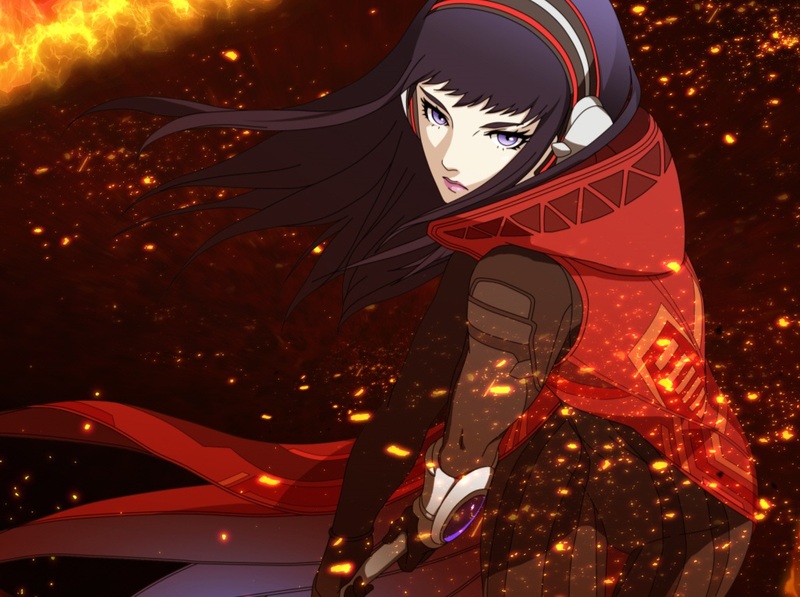 Shin Megami Tensei: Strange Journey transcends the standard dungeon crawler. Posing innumerable questions about reality while using the dungeons themselves to full effect, it will keep players thinking even when slaying demons. Redux is not some grandiose HD reimagining with a bloated budget but an insightful expansion to a masterpiece’s original vision.